When we take family vacations, we often go to a resort. We find it a great opportunity to relax and do as much or as little as we like. While it’s always tempting to spend our days lounging on the beach or enjoying cocktails by the pool, we do make time toind some meaningful activities to engage in as well. But as our daughter gets older, finding fun activities that we all agree on can be more difficult. On a recent trip to Phuket, Thailand, I knew that visits to Buddhist temples just weren’t going to do it for her. But when we came across the Gibbon Rehabilitation Centre in the Khao Pra Thaew National Park, even our fickle tween was hooked. Not only did we have an opportunity to see these amazing animals up close, but we learned a lot about the need for Gibbon conservation. While it’s been illegal to capture or keep Gibbons in Thailand for many years now, unfortunately the practice is still widespread. The laws are ineffective in part because police don’t enforce them. Gibbons are commonly kept as pets and used as tourist attractions by street hawkers, who sell photos of tourists holding the gibbon. 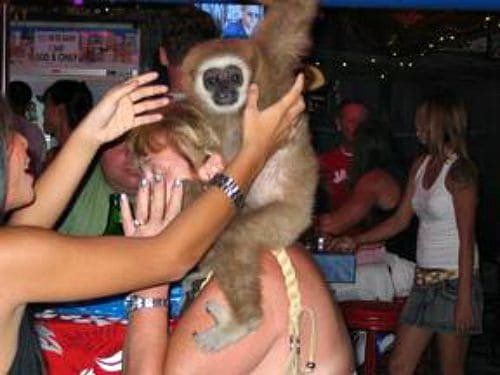 In tourist hotspots such as Patong and Pattaya, the primates are often kept in bars and nightclubs. Many are mistreated, and some are even maimed. Sadly, these captured Gibbons have a very short “working life.” When they get to age 6 or 7, they develop canine teeth and often become more aggressive. Once they are no longer cute and compliant, many are killed. Others have their teeth filed down, and are chained or kept in tiny cages. The lucky ones are handed in to organizations such as the Gibbon Rehabilitation Center. 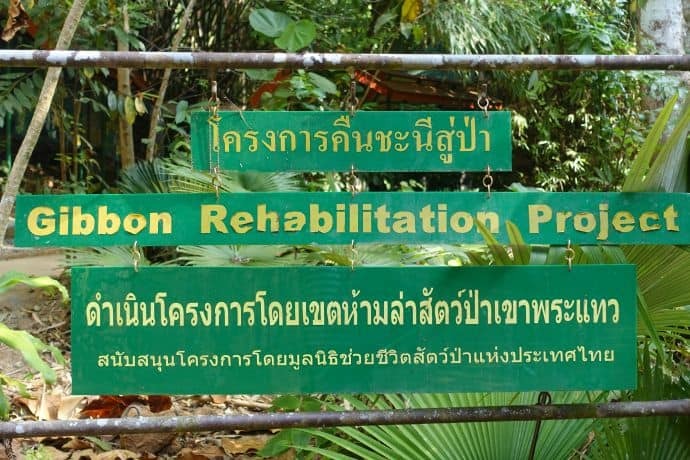 Operated by the Wild Animal Rescue Foundation of Thailand (WARF), the Gibbon Rehabilitation Centre was opened in Khao Pra Thaew National Park in 1992. There is an entrance fee to the park, but entrance to the centre itself is free. The centre completely relies on donations and volunteers to carry out its important work. The center’s entrance is very understated and low-key, with no fancy signage, gimmicky marketing or sophisticated displays. 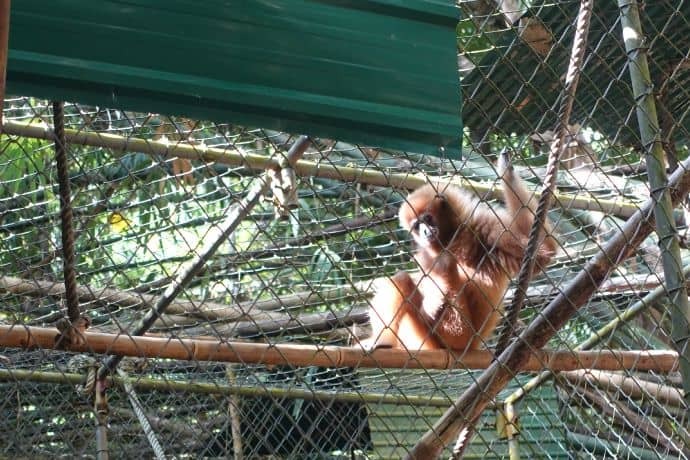 There is a small display about the types of Gibbons found in Phuket, and another on the rehabilitation process. A simple souvenir shop is the only commercial activity visible. The day we visited, just two volunteers– one English, one German– were on duty. Through them we learned about the history of the center and its work in Gibbon conservation. Then we were free to visit some of the Gibbons and ask questions. The Center releases rehabbed Gibbons into the National Park, and we could hear their songs reverberating through the forest. There are six Gibbons who make the centre their permanent home, because they are unable to be released into the wild or have “failed” at rehabilitation attempts. 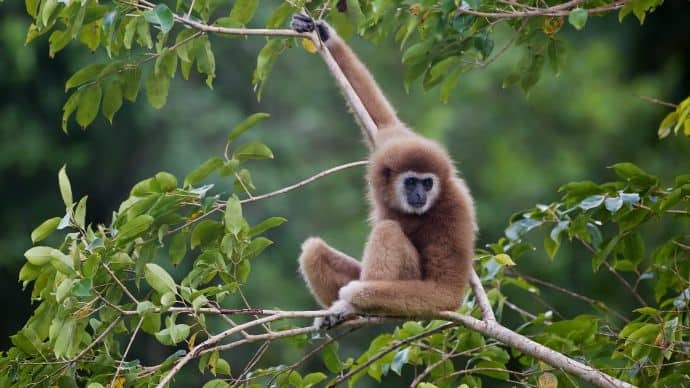 The Gibbons actively being rehabilitated are not shown to the public: They are removed from human contact progressively so they can make their move back into the forest. But the work of the Gibbon Rehabilitation Centre doesn’t end with the animal’s release. 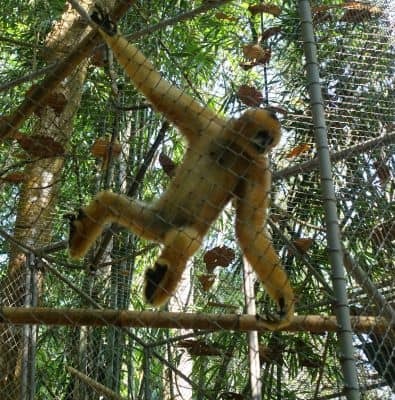 All released Gibbons are monitored to ensure their ongoing safety. Any animal who isn’t coping well in the wild is brought back to the centre for further rehabilitation before eventually trying again. As we watched the Gibbons playing in their cages and calling out to each other, the volunteers told us the animals’ stories. We watched the antics of Rambo, an older male who seemed to really like people: He was an entertaining show-off who was eager to “talk” to us, which is exactly why poor Rambo couldn’t be released back into the wild. Rambo loves humans so much that he failed at rehabilitation six times before a decision was made to keep him safe in the centre. Some animal rights advocates might protest that that’s not where Rambo belongs. But at least he is happy and safe with his people and Gibbon friends. Rambo’s favorite companion is a disabled young female named Gibby, with whom our daughter was fascinated. Gibby was found chained, and one hand and one foot ultimately had to be amputated, so there’s no real chance of rehabilitation for her. But she seemed to love playing in her cage, and it was fun to watch her swinging on her tire. We were told that the behavior we were enjoying so much was precisely why Gibby could not be released. Taken away from her mother at a very young age and kept separate from other Gibbons, poor little Gibby had never grown up. She didn’t know how adults were meant to behave, or what she was meant to do to survive. She was trapped in her childhood. The saddest story we heard at the centre was that of a young male, who still had hopes of rehabilitation. He had been rescued from being a “bar Gibbon” in Patong, where he had subsisted on a diet of hamburgers, Coke and cigarettes. Apparently, some people find that sort of thing amusing. When he arrived at the GRC, he had no idea how to be a Gibbon. He was soon taught that fruit was good for him, and he didn’t need hamburgers to survive. Don’t buy a gibbon or any product made from them. 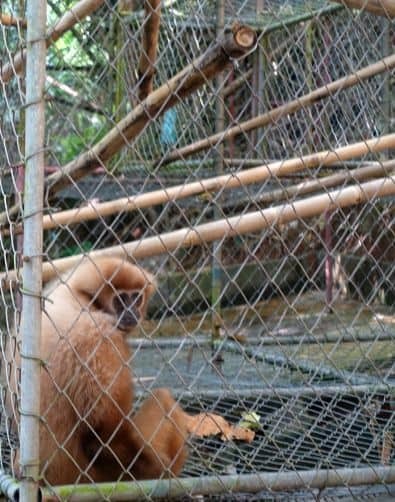 Gibbons sold as pets have been illegally captured from a forest. Don’t pay to have your photo taken with a Gibbon. It’s not cute, and you’re just encouraging a cruel and illegal practice. Apparently street hawkers with gibbons and other animals are quite common in Patong. Trust me, your holiday will not be ruined if you don’t get a photo with an ape on your shoulders. Do not frequent nightclubs with Gibbons on the premises. They do not belong in bars. They don’t belong in tiny cages. Watching them smoke cigarettes and drink Coke is not funny, and it’s definitely not entertainment. These premises do not deserve your business. If you come across any evidence of poaching, alert authorities such as the local police or the Thai government’s National Park, Wildlife and Plant Department. Be a responsible tourist and support activities that encourage rainforest conservation. This protects the Gibbons’ habitat. Also, don’t buy products that are made from rainforest timbers, which lead to deforestation. Visit the Gibbon Rehabilitation Center. While you’re there, learn more about Gibbon conservation and what you can do to help. 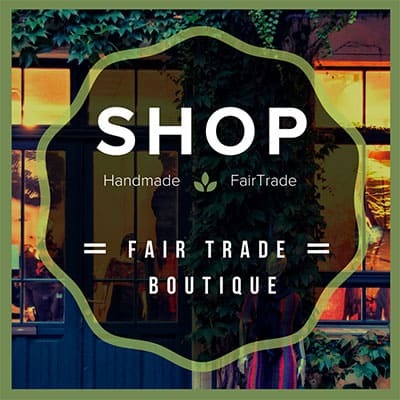 Make a donation or buy something in their shop (even a postcard or key ring will help). After your visit, tell your friends and fellow travelers about the Gibbon Rehabilitation Centre and its important work. You don’t need to make a financial contribution to help. If you’re passionate about Gibbon conservation and have the right qualifications, why not consider volunteering at the Gibbon Rehabilitation Center? According to their website, if you have experience in biology, ecology, education, conservation or ecotourism, they would love your assistance. Symbolically adopt a Gibbon. A meager $60 donation will keep one Gibbon and aid in its rehabilitation for a whole year. The Gibbon Rehabilitation Center is a registered non-profit charity in Thailand, and left a lasting impression on our family. Our daughter adopted Gibby, and loves knowing that she has helped an important cause. We’re returning to Phuket for our vacation next year, and she’s already requested another visit to see Gibby and her friends. Resort vacations may be fun, but teaching your child an important lesson and leaving a lasting impression on them is priceless. 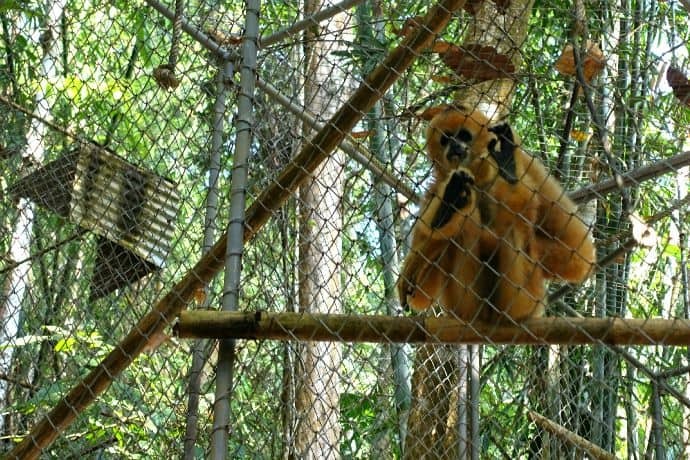 The Gibbon Rehabilitation Centre is located in Khao Pra Thaew National Park in central Phuket. 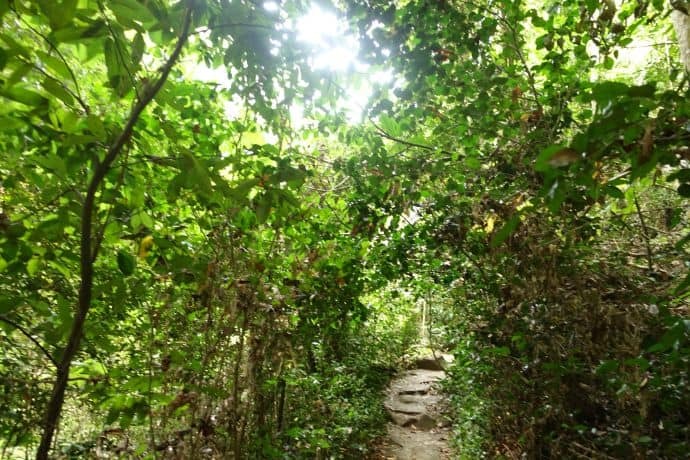 When entering the National Park, the centre is on the way to the Bang Pae Waterfall (which is only 400 metres away and makes for a beautiful rainforest walk). Many tour companies offer trips to the National Park and the Gibbon Rehabilitation Center, but unfortunately they combine the visit with a tour of a nearby elephant-riding facility. For more on why you should never ride elephants, check out GGT’s post on Elephant Nature Park. If you’d prefer not to ride elephants, hiring a driver or your own transport may work best.